An exit point is an element of a state machine. An exit point pseudostate is an exit point of a composite state. The exit point changes the "enter-exit-do" sequence. An exit point is used to join an internal transition terminating on the exit point to an external transition emanating from the exit point. The symbol of an exit point is a circle around a cross. The symbol of an exit point is placed on the border of the containing composite state. Composite state 'Composite state 3' is exited. Simple state 'Simple state 2' is exited. 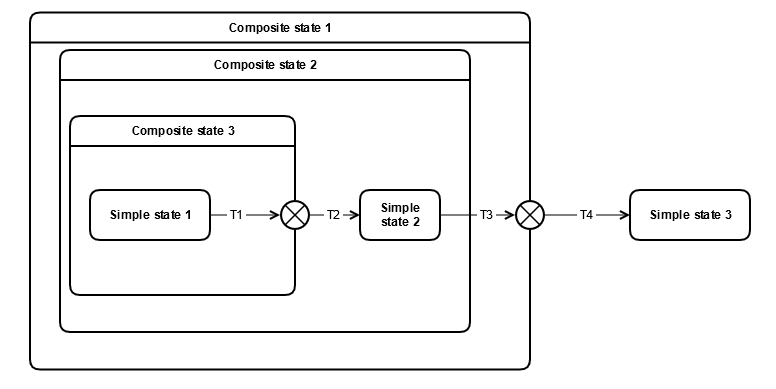 'Composite state 2' and 'Composite state 1' are exited. Simple state 'Simple state 3' is entered. Simple state 'Simple state 1' is exited. Composite state 'Composite state 2' is exited. 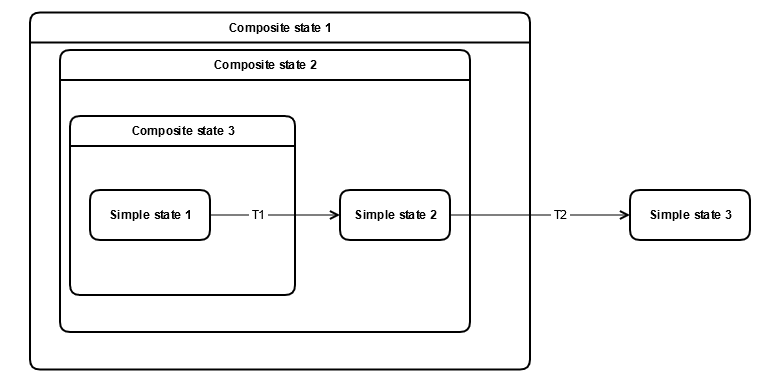 Composite state 'Composite state 1' is exited. Simple state 'Simple state 3' is entered and executed. Composite states can contain multiple exit points. An exit point can have multiple incoming and outgoing transitions. When the exit point is contained by an orthogonal composite state, than it is handled as a join, else as a junction. Exiting a composite state via an exit point implies that the exit behavior of the composite state is executed after the action of the transition incoming the exit point.